England will head to the World Cup this summer with the backing of fans from the other home nations, according to a BBC Sport survey. A UK-wide sample suggests the majority will support England - with 76% of the Northern Irish and 83% of the Welsh backing Sven-Goran Eriksson's men. And even 67% of Scots questioned would be happy to see the Auld Enemy do well. The poll also indicated that roughly 75% of people in the UK are happy that London is to host the 2012 Olympics. There would also be widespread support for England from the home nations should they reach the final in Berlin on 9 July. Asked if they would support England over old foes Germany in the final, 85% of those in Wales said they would, along with 81% of those in Northern Ireland and 69% of Scots. But if David Beckham were to lead his side out to face Brazil in the Olympiastadion, their support would slightly reduce - with 80% in Wales, 74% in Northern Ireland and 65% in Scotland saying that they would back England. Choice of anthem before England kick-off their matches this summer also produced some interesting results. Only one age group chose God Save the Queen - curiously the 18-24 age group - while 55% of those above 65 preferred to see Wayne Rooney and Steven Gerrard belt out Land of Hope and Glory. And what about the fans inside the ground? Is it still appropriate for England supporters to taunt the host nation with renditions of The Dambusters and the Great Escape themes? Well, yes, according to more than a third (35%) of 18-24 year-olds. But significantly, the majority of all those asked - including nearly four out five of those aged 55-64 (79%) - believed singing such tunes was offensive. 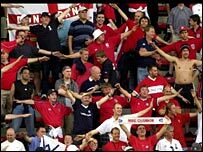 An FA spokesman told BBC Sport: "We have launched a campaign to encourage fans' respect for our hosts this summer and to generally improve the image of England supporters abroad. "We certainly don't see the singing of songs like the Dambusters theme as appropriate and it's encouraging that the majority of people in your survey agree with that. "It's also pleasing to see England appearing to have the support of the rest of the UK - I think the whole nation will be gripped once it gets going and hopefully people will get behind them." Meanwhile, the BBC Sport survey also focused on the nation's take on the 2012 Olympics. Regionally, there is strong support for London being awarded the Games. 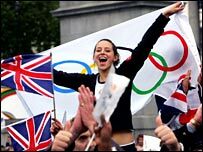 Overall in the UK over three-quarters (77%) were pleased that the Games are coming to London, but support is ironically greatest beyond the capital. It showed that around 75% of English, Welsh and Scots were happy that the Games were heading to London. But in Northern Ireland, the enthusiasm rose to 82%. However, nearly a quarter of Londoners (24%) are not pleased that their city won the Games bid - only the North-East (32%) and the West Midlands (29%) are less pleased. Opinion about the Olympics also differed markedly by age group. Most pleased about London 2012 were those aged 18-24 (86%) while those that were most displeased were those aged 65+ (27%). The regions' greater enthusiasm for the Games was not a surprise to the London Organising Committee of the Olympic Games. "It certainly matches what we are hearing from the regions and the rest of the UK," a spokeswoman told BBC Sport. "I think there is a feeling that others cities will share the benefits that will come with holding the Olympics in this country - for example, the preliminary rounds of the football will be at various grounds across the country." Meanwhile, a significant number of Scots - 43% - would prefer to see their athletes compete at the Games under their own flag, and not as a combined Great Britain team. These results may have been buoyed by Scotland's record haul of 29 medals at the recent Commonwealth Games - including 11 gold, seven silver and 11 bronze. But 66% of Welsh, 59% of Northern Irish and roughly three quarters of English preferred to compete under the Union Flag as team GB. ICM Research interviewed a random sample of 2,367 adults aged 18+ by telephone on 24th-28th March 2006. Interviews were conducted around the UK, with boosters to 500 in Scotland, Wales and Northern Ireland. Data has been weighted to the profile of all UK adults. ICM is a member of the British Polling Council and abides by it's rules. Send us your comments about England being supported by a majority of fans from the other home nations using the form below and we will post a selection here. I hope they do well, but I don't want them to win because the press will be on about it for the next 40 years. It's just not worth it. Unlike the majority of Scots I will be supporting England in the World Cup. The majority of Scots are put off the English by the hype from the media of an average team that will do well to get to the semi-finals. I know this doesn't include my country but England is supported by many over here. Good luck boys. Will we ever come to our collective senses and have a UK team? We might actually win something. If the Welsh football team were actually any good then we wouldn't have to have this debate. Of course I'll support England - at least they took the trouble to qualify! I'm a proud Ulsterman and was understandably delighted when Northern Ireland beat England at Windsor Park last September. But when the English line-up at the World Cup and God Save The Queen is sung loud and proud by their magnificent supporters, they will receive my full backing. I'm never going to support England in any competition. I'm Welsh and proud of it but there are limits. They are neighbours and that's it. I will be cheering for everyone England play. I am happy that all of us pull together to support the England team. It reminds me greatly about the recent Commonwealth games. I found myself not just supporting England but also Scotland, Wales, Northern Ireland, Jersey and Guernsey. I'm sorry, but I find the figures for Scotland incredible!!! This confirms what I have always insisted, i.e. that the anti-English sentiment in Scotland exists for a small but vocal minority. Most are rightly proud to be Scottish, but also proud of being British, and there should be no conflict.